Do you have tired heavy legs with tender areas that may have bulging veins? You may have venous insufficiency. 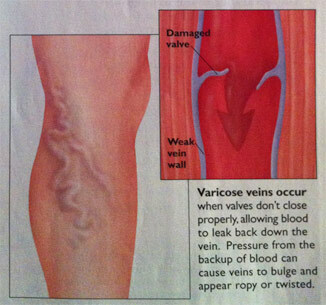 This means that the valves inside a vein in your leg may be broken. This causes poor circulation and those bulging veins that are often painful. Dr. Prylinski offers a laser treatment that minimizes your down time and has proven results. We can set you up for a initial consult then you and Dr Prylinski can decide the plan to correct this circulation problem.